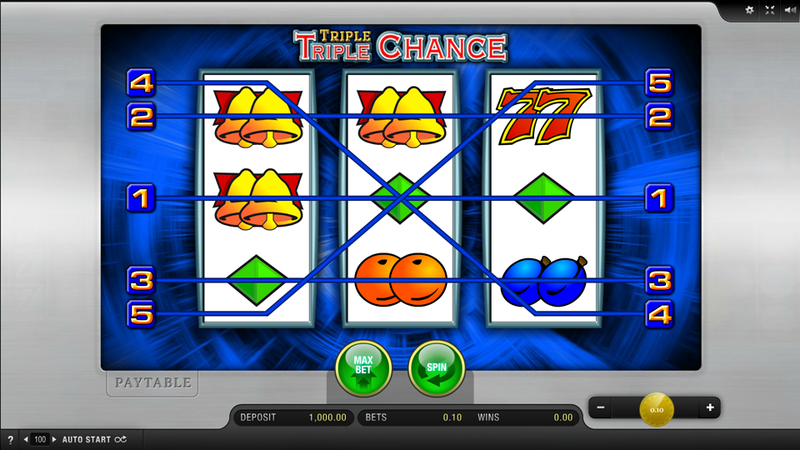 Shiny and colorful, Triple Triple Chance is a challenging and rewarding 3-reel 3-row video slot machine with 5 fixed paying lines produced by Merkur coming in both free play and real-money modes around the sites powered by this reputable software producer. The Triple Triple Chance slot review will show you a couple of tips much needed to improve your odds for a 3000-coin non-progressive jackpot prize. A screenshot is worth a thousand words, right? Here you go! But in the end, you have to try Triple Triple Chance yourself – one of the recommended casino sites should fit perfectly! Much resembling of the most popular one-hand bandits from the old days, the game requires 3 symbols of the same kind to be matched on the paytable in order to form a winning combination. Fruits like Melon, Cherries, Lemon and Orange may bring up to 160 coins, while the Bells pay a bit higher, boosting your bankroll with a maximum of 240 coins for 3 of the kind. The coins range from €0.05 to €20 and you can land a big win of 3000 coins when match 3 Triple Seven icons on an active paying line. After each winning round, you can turn the Gamble feature on and try to double or quadruple your winnings. Get any symbol that appeared 9 times in a row and the Rewin Feature, which basically works as the free spins bonus round, will be triggered and you’ll get another chance to fill the Full Screen circle. Once it starts turning, you can win it again if it stops on a green field, but if the running light stops on a red field then the feature is ended. Remember that the Rewin feature can take place a maximum of nine times. Yes, you can play the game on a mobile device. Demo mode is enabled too and there is no need to download any app for this purpose. 3. What is the RTP factor of Triple Triple Chance? According to the Merkur’s officials, the RTP stands firmly at 95.87%. Tons of quality entertainment, a fresh dose of nostalgia packed into a modern environment and a challenge that eventually pays out are the game’s most important features. Depending on your skills, you’d might want to try to improve your rating or simply look for a better-paying option elsewhere.